Gaelyn and Atom began collaborating in 1999 and they closed the doors to their East Village design showroom six years later in 2005. This Deisgn duo was driven to create fashion with a focus on preservation. This dedication to sustainble concepts shined through their work while juxtaposing timeless romantic elements with edgy fashion forward experimentation. G&C's designs met instant acclaim and featured everywhere from Italian vogue, the Grammies, MTV, New York, and Paris Runways. They took sustainable fashion to a global audience. 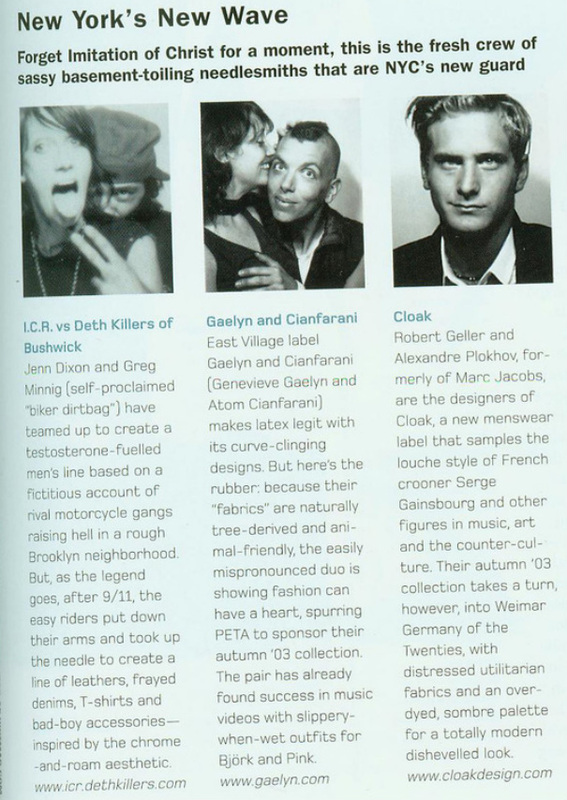 G&C had no idea they would serve as an inspiration and impact so many young and up and coming Sustainable Designers. Celebrities and fashion followers from all over are captivated and by the ingenuity of Gaelyn and Cianfarnai. Britney Spears, Christina Aguilera, Pink, Christina Ricci, Vivica Fox, Bjork ,Shania Twain, Skakira, Linda Evangilista (NARS Print Ads), Sandra Bernhard, Tyra Banks and several Americans Next Top Model contestants. The list goes on to include top fashion photograghers Steven Misel, Steven Klien, and David Lachapelle. Atom Cianfarani is a Canadian designer, sculptor, and green roof designer. Everything Atom creates has an integral commitment to preservation. She studied fine woodworking and philosophy before breaking into fashion. Her passion is finding a re-use for the garbage we produce and is a self titled Discarded Commodity Designer. Re-use with good re-design is her solution to our urban society. Expanding the boundaries between her passion for found materials and good design, Cianfarani creates a space where innovation is born. After working as the Co-Creative Director of Gaelyn and Cianfarani she designed Brooklyn's famous Eco-Eatery Habana Outpost, designed the world's first Light Pipe Chandelier, was a guest lecturer and critic at the North Americans first accredited sustainable fashion course, and is working as a sculptor who creates animal habitats and examines "urban bioremediation”. She is now working as one of North America's premier green roof consultant and is the co-author of a DIY guide to Green Roofs. Genevieve Gaelyn, Co-Creative Director of G&C, studied to be a fine art painter and was a self taught pattern maker. Gaelyn apprenticed with costume designers and world famous corset makers before collaborating with Cianfarani. She now lives in Utah and teaches art.